We believe that your website worth viewing on any device and can help you with that by offering professional PSD to responsive HTML / HTML5 conversion service, that guarantee perfect user-experience. When it comes to website business, it is crucial to differentiate and track trends to be able to timely upgrade your online presence or refresh a website. Today e-business competition requires from entrepreneurs to let their customers the best services and user experience to stay on top, and responsiveness is one of the most acute website features. With a growing popularity of mobile devices converting designs to responsive HTML/HTML5 and CSS became a real must-have for any online community or a business. Responsive websites are not just squeezed to fit in the screen, but re-architected so that you can conveniently use them on small screen without zooming each page. PSD to responsive design service is an important and complex piece of development work and it's essential to find experienced coders to trust with your project. Why to convert PSD to responsive HTML / HTML5? The idea of responsive design is to make it equally good-looking on any device: desktop, smartphone, tablet, etc. For PSD to responsive HTML/HTML5 conversion developers use special technique called CSS Media query. With the help of this technique we make web pages adaptive by limiting some CSS properties. Media queries let us set CSS rules based on such things like width and height of a device or a viewport, device-orientation, resolution, etc and apply ideal CSS style. As a result you get your website fitting certain devices without hurting the content. Search engines, Google for instance, like responsive sites, they increase such sites in organic search results. Besides responsive web pages load faster, whereas low speed can result in traffic reduction. People spend more time on Internet using convenient mobile devices, rather than desktops, so if you will convert your PSD into responsive HTML/HTML5 the percent of users who enter the site and then leave (so called 'bounce rate') can reduce. Responsive layout is especially important for online stores, since click-through-rate on such sites are higher than on their desktop or mobile versions. Mobile devices are obviously a base of the web industry that has a great potential. Go ahead of time by getting a responsive site. Why should you choose SocialEngineMarket for your project? Our coding is well-structured and crystal-clear, which is accomplished through entirely manual coding and all the require standards. We ensure professional look of you website layout outside and in. If you let us convert your PSD designs, you can be sure that the final web page will be pixel-perfect to the initial image. We provide top-quality extensible code, which guarantees beautiful front-end, but also highly flexible back-end. The stage of coding is only half the story. Once the development process is finished and responsiveness is added, we start the stage of testing to make sure you get completely functional web pages. Our Quality Assurance specialists test browser compatibility in the most common web browsers using the latest tolls for both desktop and mobile devices. W3C is an association that develops web standards. Professional markup comply with all the guidelines and requirements set by the consortium. 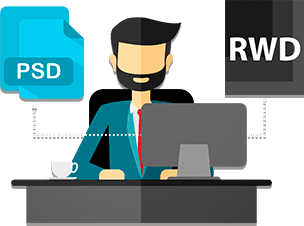 We make sure that your PSD files we convert correspond all the necessary criteria in order to confidently guarantee smooth and effective further performance. The rank of your site in search engines depends on its optimization. We use the most recent technology to code lightweight SEO-friendly pages, that can be flawlessly indexed by Google, Bing and other. Responsive, fast loading pages can significantly lift your site in search-engine results. If you are just investigating the market in search of that very PSD conversion experts, don't hesitate to contact us! Once we receive your query, experienced specialists will assist you right away. You can freely ask all possible questions and be sure to get clear and precise answers. When you hire a team of programmers to work on your project, that's important to be up to speed on the situation on every stage of development. Being aware of the details allows you to streamline the work to the best advantage. We review your query and analyze the PSD you attach. We contact you and go into details of your project. We slice your PSD design into image segments. Coding images we make them fit any device screen.